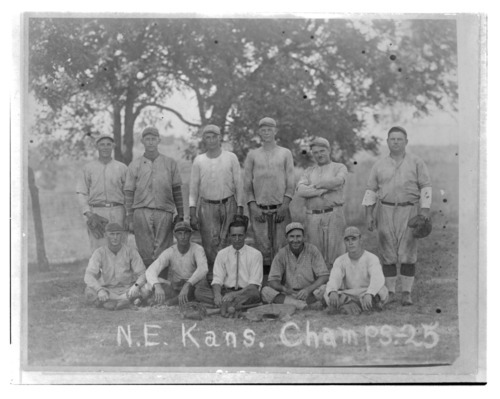 This is a photograph of the McLouth baseball team from 1925. The photo includes the caption, "N.E. Kans. Champs - 25." The team defeated a semi-professional team from Leavenworth, bolstering its regional championship claim. Team members are identified as follows: (back row, left to right) -- Ted Gentry, Ed Schmidt, John Winfrey, John Cass, Howard Chapman, "Dutch" Earl Chapman; (front row, left to right) -- Hobart Herries, Rollie Laster, Elgie Jones, Jess Laster, Galen White. This is a photograph of the McLouth baseball team from 1925. The photo includes the caption, "N.E. Kans. Champs - 25." The team defeated a semi-professional team from Leavenworth, bolstering its regional championship claim. Team members are identified as follows: (back row, left to right) -- Ted Gentry, Ed Schmidt, John Winfrey, John Cass, Howard Chapman, "Dutch" Earl Chapman; (front row, left to right) -- Hobart Herries, Rollie Laster, Elgie Jones, Jess Laster, Galen White.